ALL IN THE FAMILY: The Genesis of A Classic | THAT'S ENTERTAINMENT! This post is dedicated to my dear friend Lisa, whose fond memories of love and laughter with her father truly exemplify the beauty of the situation comedy – bringing people together in joy. Last week’s Wildcard Wednesday post highlighted a forgotten show. Today’s post intends to do just the opposite. All In The Family will be remembered forever. To put it simply, this series changed television. It challenged all the established rules and broke ground that few shows before had ever tried to do. So it should come as a surprise to no one that it was a struggle to get the show on the air. Based on a British show, three American pilots were made before the series was picked up in late 1970. Both pilots were released on DVD in “The Norman Lear Collection.” Unfortunately, for fans, like me, who picked up individual season sets of Norman Lear’s shows, the bonus disc with these two rarities was unattainable. Fortunately, I was able to get my hands on copies of both presentations. This post will examine all three pilots. Archie Bunker, a conservative working-class family man with outdated and bigoted views, clashes with his liberal son-in-law, Michael Stivic (nicknamed “Meathead” by Archie), over important issues of the day. Also in the house are Archie’s sweet, but dingy wife, Edith, and their daughter, Gloria, who is caught between the ideals of her father and her husband. 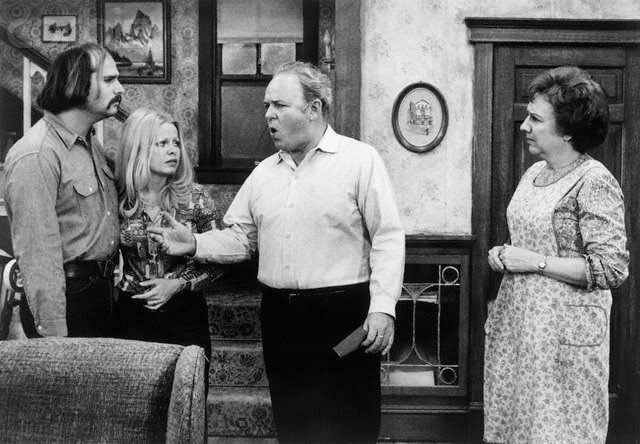 All In The Family stars CARROLL O’CONNOR as Archie Bunker, JEAN STAPLETON as Edith Bunker, ROB REINER as Michael Stivic, and SALLY STRUTHERS as Gloria Bunker-Stivic. It will be a while before we get to 1971 on Situation Comedy Tuesdays, so this post should tide you over until then, when we get around to discussing the series and some of its best episodes. First, let’s talk about it’s tortured labor. The first pilot, And Justice For All, was produced in 1968 with a script incredibly similar to the aired pilot produced of two years later. O’Connor and Stapleton played Archie and Edith Justice. But this time, Kelly Jean Peters played their daughter, Gloria, and Tim McIntire played her husband, Richard (or “Dickie”). In this incarnation, Gloria’s husband was not a dumb Pollock, instead he was a dumb Mick. Also on hand was D’Urville Martin as Lamont Jefferson. The episode is 35 minutes long — about ten minutes longer than it should be — and it’s a definite hinderance. The pace is slow, with only O’Connor seemingly able to propel the lengthy script. Stapleton gives a performance very similar to the one in the aired version, more in-line with her British counterpart. Like in “Meet The Bunkers”, she’s less dingy here; it would take a couple of episodes into the first season before her dingbat persona was fully established. Peters and McIntire are so harsh in their portrayals of the “bleeding heart liberals” that it’s very difficult to like them. The audience spends most of the time in silence during their stuff. Only Archie and Edith get big laughs in this first try. It seems like it would be a very obvious decision to replace them. The opening song, “Those Were The Days”, features extended lyrics, but no clips of Archie and Edith on the piano. Most of the script is the same, with little things here and there that were taken out for time. Several bits would find their way into later episodes. For instance, a debate over link vs. patty sausages ends up in a first season episode entitled “Gloria’s Pregnancy” (a.k.a.) “Gloria Has A Belly Full.” Also, the bit where Archie says “Goddamn” and explains to the family that both words are Holy because they came from the Bible was strictly prohibited in 1968, but ended up in a 1973 episode, as Archie and Mike argue about Watergate. Only two deleted pieces of dialogue have merit. The first is a three-minute continuation of Archie’s disgust for his daughter and son-in-law’s lack of belief in God. The other is a pretty funny bit where Archie tells the family that he used to be friends with a whole flock of black people, before he met Edith, of course. One in particular, he says, was named Elmont Cumberbatch. It’s clear now, with 20-20 hindsight vision, that O’Connor and Stapleton are dynamite, and that this very funny script, although in need of some trimming, would be better if handled by a stronger supporting cast. However, it wouldn’t have mattered who played Gloria and “Dickie” here; ABC did not think American audiences were ready for And Justice For All in 1968. Maybe they were right. The second ABC pilot was called “Those Were The Days” and was produced in 1969 with a different Gloria and Richard. Here they were played by Candy Azzara and Chip Oliver, respectively. Martin returned as Lionel. Azzara and Oliver were the exact opposites of Peters and McIntire, lacking in depth and looking as if they’d rather be anywhere else. They seem even less appropriate than the actors in the former pilot. With an edited script, this pilot runs approximately 27 minutes and is almost identical to the episode audiences would eventually see. O’Connor and Stapleton are even better in their roles this time. In fact, Stapleton gives her best performance out of all three pilots here, playing the role closer to the high-voiced dingbat Edith would become famous as. In the aired pilot, she plays it more low-key and sarcastic, like she did in the ’68 pilot. It works great here. “Dickie” is still a Mick in this ’69 version, and the “Goddamn” bit is still present. Other than that, the pilot is not much different from the final version. 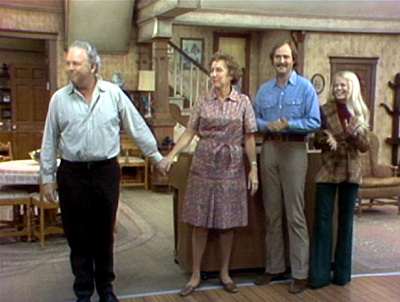 The final pilot was produced and picked up in December 1970 by CBS with the two kids that viewers would soon become familiar with: Sally Struthers as Gloria and Rob Reiner, Carl Reiner’s son, as Michael Stivic, who was graduated from Mick to Pollock. Their chemistry with each other and with O’Connor and Stapleton is already a welcomed strength, and they both seem to have a natural knack for comedy. Mike Evans plays Lionel and he is instantly more likable and believable than Martin. Aside from a few sharper zingers given to Archie, the only script addition is a bit of emphasis placed on Archie’s yen for college student Mike to get a job and stop mooching off of his in-laws. It helps to establish their mutual antipathy. With that third pilot, a classic was born. And like Lisa and her father, many of us laughed and loved with the Bunkers. All three pilots are available in varying qualities on YouTube. You can contact me for access to any or all three. Also for your enjoyment, here is a clip of the cast singing parodied lyrics of the theme song during a sketch performed live before a 1975 taping. Come back next Wednesday for another Wildcard Wednesday post! And tune in tomorrow as we continue counting down the best episodes of Xena: Warrior Princess. Hi, Jackson. I just found this today since you mentioned this post in your AITF Season 1 review. Great job as always. I just have one correction: Mike Evans played Lionel Jefferson in the pilot and kept the role until after Season 1 of The Jeffersons was over in 1975. Damon Evans didn’t play Lionel until Seasons 2-4 of The Jeffersons (1975-78), after which Mike Evans took the role back over. I’ve seen the first pilot and remember Archie’s black acquaintance, Cumberbatch. That’s probably where Norman Lear got the name for the Bunker home’s eventual owner, Ernie Cumberbatch (played by John Amos), for the sequel series, 704 Hauser. Good catch. I have amended the post.